Background: Diabetic retinopathy (DR) is one of the major complications of diabetes mellitus (DM) and is the leading cause of blindness among working people. It constitutes 5% of the global causes of blindness. Knowledge, attitudes, and practices (KAPs) on DR among medical residents (MRs) and general practitioners (GPs) should be well assessed to insure a very good level of DR care. These groups are the most important primary health provider of the diabetic care network. Objectives: The aim is to assess the KAPs on DR among MRs and GPs in Sudan. Materials and Methods: Two hundred and twenty-five doctors, as the study population, were chosen from Khartoum state nonconsultant nonprivate working doctors, who are working in 22 general hospitals distributed across Khartoum state, between August and September 2016. All the selected study Personale were working in these hospitals, and they were exposed to diabetic patient's care which is available within the facilities of these hospitals. Specialist, consultants, and private doctors were excluded from the study. Data were collected through a well-designed self-administered questionnaire. The questionnaire was mainly included closed-ended questions with a few open-ended ones. It contains questions on demographic data, knowledge and awareness levels, practices toward screening DR, and questions on attitudes toward DR. At the end of the survey, the entire data were coded and entered into a Microsoft Excel spreadsheet in a personal computer. The responses were analyzed using Statistical Program for Social Sciences (SPSS) version 20 (Manufactured by IBM SPSS Inc., PASW Statistics for Windows, Version 20.0; 2009. Chicago: SPSS Inc., IL, USA). Results: Two hundred and twenty-five doctors; (GPs and MRs); were included in the current study. One hundred and thirty-seven (61%) of the responded participants were female and 88 (39%) were male. The mean age of the study group was 27.7 ± 8.0 years (range: 20–36 years). Two hundred and twenty-five questionnaires were distributed to all members, only 180 (93.75%) members completed the questionnaires. Fifty-eight (32%) has MBBS and 123 (68%) has MBBS + part one in medicine. Their years of medical practice was ranged from <1 year to >2 years. One hundred and sixty-one (92.5%) and 155 (89.0%) mentioned eye and kidney, respectively, as the organs affected by DM. One hundred and fifty-eight (90.8%) mentioned retina as the part of the eye that can be affected. One hundred and eighteen (68.0%) mentioned poor glucose control as the factor that influences the presence or severity of DR. Fifty-nine (34.0%) mentioned duration of DM. Fifty-six (32.4%) high blood pressure high and 13 (7.5%) lipid level is important for DR degree. One hundred and sixty-four (95.0%) respondents, mentioned retina as the part of the eye that should be examined first for changes for DR. Ninety-one percent noted that DM can cause eye complications; new vessel formations. Hemorrhages, retinal detachment… etc. Seventy-five percent have the attitude to examine the diabetics when only the vision is affected. Fifty-one percent strongly agreed to do eye examination in diabetic pregnant and to do fundoscopy for any diabetic patient. Thirty-seven percent strongly agree to check eyes when lipid is high. Most of the respondents, i.e., 99 (59%) strongly disagree that ophthalmology training in medical school was enough to detect patients with DR. Seventy-two (42%) do visual acuity for their diabetic patients and 50 (30%) examine the fundus (retina). One hundred and twenty-six (75%) disagree that eye examination is only required in diabetic patients when vision is affected. Conclusion: Participants generally had a poor knowledge on DR although they had good knowledge about relationship between DR and others end organs which can be affected by microvascular complication of diabetes mellitus and good practice in referral of diabetic patients 136(81%). Undergraduate ophthalmology training in medical school is not adequate. Globally, diabetes mellitus (DM) is one of the most common noncommunicable diseases, which started to show an epidemic mode in many low- and middle-income countries. The worldwide estimate for DM in 2011 was about 366 million people to be diabetic. Diabetic retinopathy (DR) is one of the major complications of DM and is the leading cause of new blindness among working people; 25–74 years. It constitutes (5%) of the global causes of blindness. Blindness which is defined per criteria was described by the World Health Organization (WHO) as best-corrected visual acuity of <3/60, or a corresponding visual field loss to <10°, in the better eye., Screening and early managements of DR are cost effective and is one of the priorities under the disease control component of the global initiative for the elimination of avoidable blindness. Knowledge, attitudes, and practices (KAPs) on DR among medical residents (MRs) and general practitioners (GPs) should be well assessed to insure a very good level of DR care. These groups are the most important primary health provider in any communities. Despite the growing DR burden, the disease continues to receive a relatively low public health priority in Khartoum. Furthermore, people with diabetes are 25 times more likely than the general population to become blind, that is why DR is a priority disease in the vision 2020 initiative for the global elimination of avoidable blindness, therefore, the WHO has recommended its member countries to integrate approach for DR within their prevention of blindness programs. GPs  and MRs are important members of the diabetic care network. Awareness levels of GPs are vital in planning strategies to prevent diabetic blindness. The present study was carried out to assess the KAPs on DR among nonspecialists members of the diabetic care network. In a cross-sectional descriptive study, which was conducted between August and September 2016; two hundred and twenty-five (n = 225) Sudanese males and females GPs and MR who are working in the referral clinics of medicine in Khartoum State Hospitals. Out the 540 total estimated Khartoum state nonconsultant, nonprivate working doctors. These 540 were constituting 240 GPs; as per information from the office of Khartoum Health Services, and 300 MRs per information gathered from Sudan Medical Specialization Board (SMSB). The 225 study population was selected per “Richard Statistical Equation; (n = [z/d]2× [0.50]2/ 1 + 1/N [z/d]2× [0.50]2 − 1; where n: sample size; Z: 1.96 at 95% confidence interval; d: error; N: population size).” All the selected study participants were working in these clinics, and they were exposed to diabetic patient's care which is available within the facilities of the above-mentioned hospitals. The mean age of the participants was 28 ± 7.45 years (range: 20–36 years). They were grouped into three: according to their ages: 20–25 years, 26–30 years, and the above 30 years' age groups. Two hundred and twenty-five self-administered questionnaires given out to the study doctors; 192 were submitted to, but only 180 completed by the study group. The intended participants were requested to share in the study through a well-designed questionnaire; the questionnaire was mainly comprised closed-ended questions with a few open-ended ones. It had four sections (a-d). Section (a) contained demographic data and general questions about the respondents. Section (b) contained questions on knowledge and awareness levels. Section (c) contained the practices toward screening DR. Section (d) contained questions on attitudes toward DR. The self-administered questionnaire forms were given section by section and participants were requested to complete the questionnaire without consulting any document. Clear instructions on how to complete the questionnaire were given in the questionnaire and instructions were clarified by the researchers. The researchers insured the participants to responses as much as they can to each point on the questionnaire confidentially. Data were coded and entered into a Microsoft Excel spreadsheet in a personal computer. The responses were subjected to “Statistical Analysis” by Statistical Program for Social Sciences (SPSS) version 20 (Manufactured by IBM SPSS Inc., PASW Statistics for Windows, Version 20.0; 2009. Chicago: SPSS Inc., IL, USA). Categorical variables were analyzed using frequencies and percentage. Continuous variables were summarized using mean, percentile, range, and standard deviation. Significant differences and associations were determined by values of P < 0.05. Two hundred and twenty-five (n = 225) Sudanese male and female doctors; 100 (n = 100; 44.4%) GPs and 125 (n = 125; 55.6%) MRs); were included in the current study. 137 (61%) of the responded participants were females and 88 (39%) were males [Figure 1]. The mean age of the study group was 27.7 ± 8.0 years (range: 20–36 years). 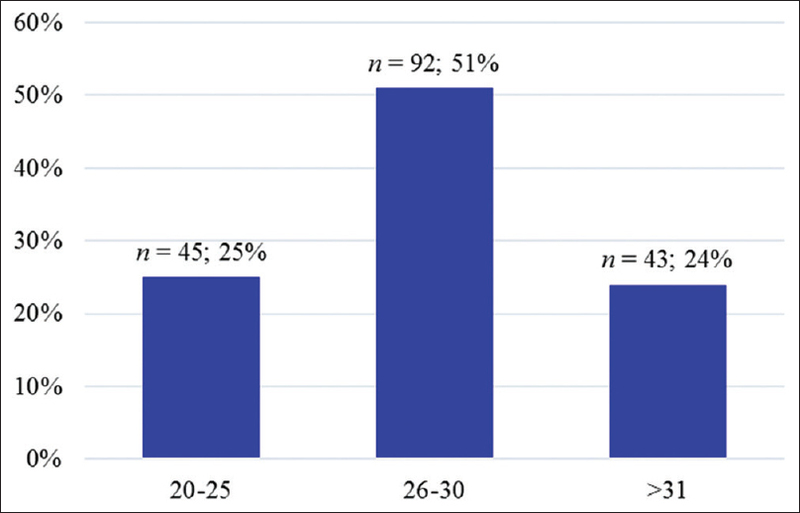 They were grouped into three groups: Forty-five (25%) within the age group of 20–25 years old; 92 (51%) within the age group of 26–30 years old, whereas the rest 43 (24%) were above 30 years of age [Figure 2]. A total of 225 self-administered questionnaires were distributed to all members of the study group. One hundred and ninety-two (85.3%) returned the questionnaire forms; whereas 33 (14.7%) failed to do; as they were not submitted, misplaced or not filled. 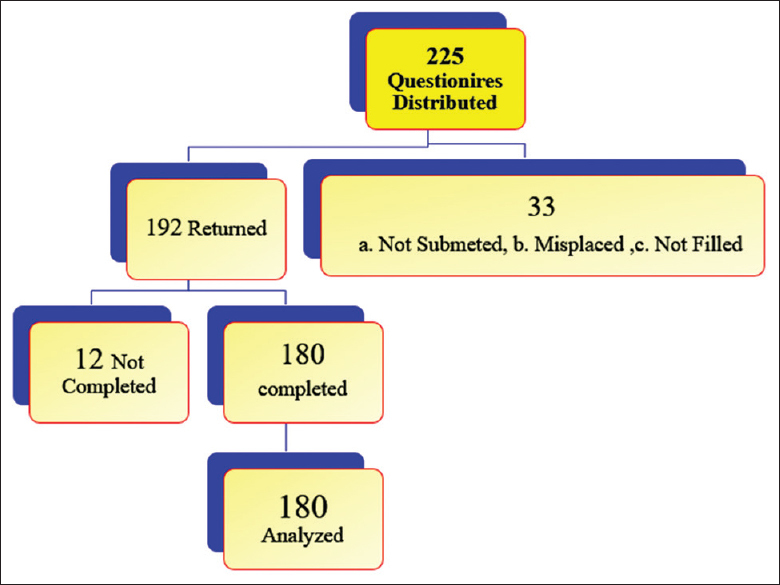 Of these 192 forms, only 180 (93.75%) completed the questionnaires points; and 12 (6.25%) did not complete their received questionnaires, as documented in the “flow chart of data collection [Figure 3].” Therefore, only 180 candidates were included in analyzed data process. 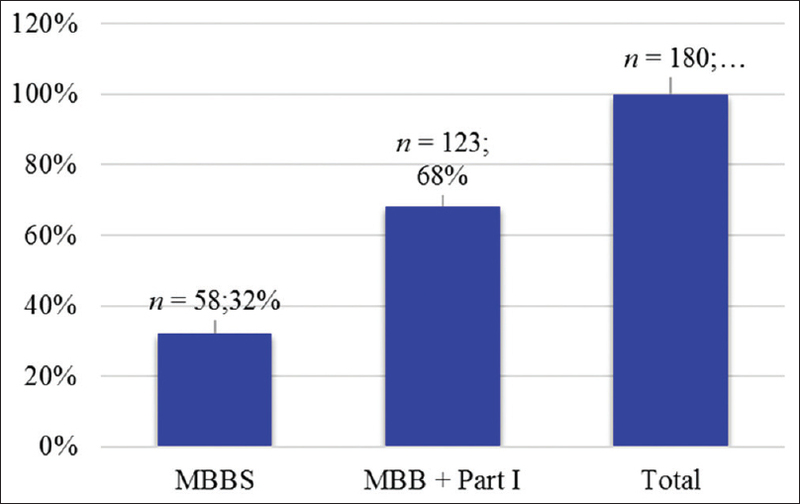 The qualifications levels of the 180 contributors were scored as: 58 (32%) with MBBS and 123 (68%) were with MBBS + part one in medicine of the SMSB [Figure 4]. Their years of medical practice was ranged from <1 year, 1–2 years and >2 years [Figure 5]. Data showed most of the respondents, 161 (92.5%) and 155 (89.0%) mentioned eye and kidney, respectively, as the organs affected by microvascular complications in a person with DM [Table 1]. Most of the respondents 158 (90.8%) mentioned retina as the part of the eye that can be affected by DM. While 9.2% pointed out other parts of the eye; ranging from lens (26.7%), optic nerve (12.0%), cornea (11.5%), iris (5.7%), retinal blood vessels (5.2%), pupils (0.6%), and some said others (4.6%) [Table 2]. The percentage of the respondents, 118 (68.0%) mentioned poor glucose control as the factor that influences the presence or severity of DR. Followed by duration of DM as 59 (34.0%) responders, high blood pressure 56 (32.4%) responders, high lipid level 13 (7.5%) responders, another factor: 13 (7.5%) responders. Twenty-nine responders they did not know the risk factors [Table 3]. One hundred and sixty-four (95.0%) respondents, mentioned retina as the part of the eye that should be examined first for changes due to DR. Twenty-five (14.5%) said optic nerve, 17 (10.0%) said blood vessels, 11 (6.5%) for iris, 3 (2.0%), 3 (2.0%) for cornea, 2 (1.0%) for others, 3 (2.0) with no response and 1 (1.0%) does not know [Table 4]. Sixty (34.7%) responded as retinal neovascularization, 73 (42.2%) retinal hemorrhage, 46 (27%). Cotton wool spot (CWS), 36 (21.0%) retinal detachment, 29 (17.0%) retinal vascular changes, and 28 (15.6), 4 (2.2%) for retinal microaneurysms and others. While 50 (29.0%) they dont know the right answer [Table 5]. The attitude respondent's response to eye examination in diabetic patients when vision is affected was: 126 (75%) strongly disagreed, 22 (13%) moderately disagreed, 9 (5%) were moderately agreed, 5 (3%) strongly agree. While 5 (3%) were neutral [Table 6]. Attitude respondent's response to eye examination in diabetic pregnant woman patients for frequent eye check-ups was: 19 (11%) strongly disagreed, 25 (15%) moderately disagreed, 33 (20%) were moderately agreed, 47 (28%) strongly agree. While 42 (25%) were neutral [Table 7]. Attitude respondent's response to fundoscopy examination in diabetic by respondent to detect early DR was: 8 (5%) strongly disagreed, 19 (11%) moderately disagreed, 46 (28%) were moderately agreed, 85 (51%) strongly agree. While 8 (5%) were neutral [Table 8]. Attitude respondent's response on a good lipid profile is essential for preventing vision loss in DR was: 22 (13%) strongly disagreed, 16 (10%) moderately disagreed, 48 (29%) were moderately agreed, 62 (37%) strongly agree. While 20 (12%) were neutral [Table 9]. Attitude respondent's response on the ophthalmology training in medical school was enough to detect patients with DR was: 99 (59%) strongly disagreed, 36 (22%) moderately disagreed, 15 (9%) were moderately agreed, 11 (7%) strongly agree. While 5 (3%) were neutral [Table 10]. The level of the respondent's practice to do proper eye examination for diabetic patients: 72 (42%) do visual acuity for their diabetic patients, 50 (30%) of the participants examine the fundus (retina) of their diabetic patients, whereas 136 (81%) of them refer their patients for eye examination directly for proper fundal examination, 34 (20%) of the participants have no access to ophthalmoscope at their work [Table 11]. Majority of the respondents 126 (75%) disagree that eye examination is only required in diabetic patients when vision is affected. Most of the respondents 99 (59%) strongly disagree that ophthalmology training in medical school was enough to detect patients with DR. Knowledge, attitude, and practice (KAP) regarding DR vary greatly depending on the qualifications of the DM health provider whether they are certified ophthalmologists, dialectologist, general physicians, family physicians, MRs, or GPs. The mean age of the present study group was 27.7 ± 8.0 years (range: 20–36 years) which was in line with Oega Kenyan study  were reported the mean age of 27.8 years with a wider range (22–48 years). 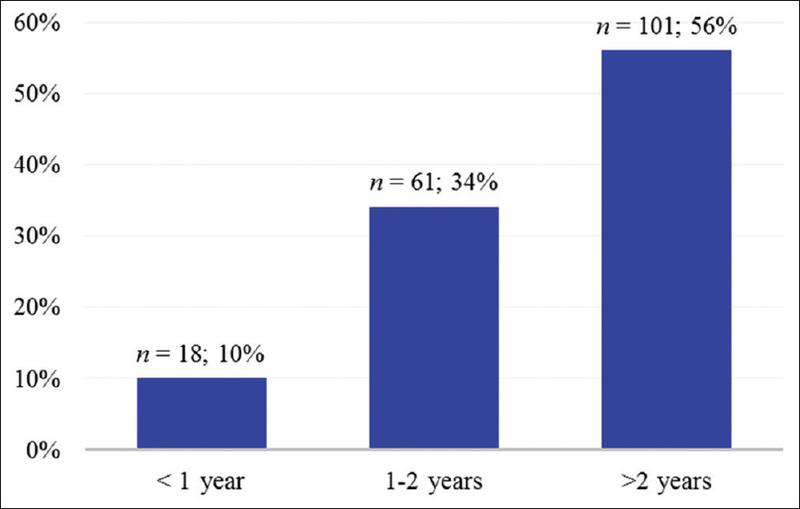 In the current study, most of the participants were residents of medicine (68%) therefore their duration of practice is more than 2 years, almost the same as the 2.4 years duration of practice in Niyonsavye Burundi's study group. While Oenga's had a duration of practice was 1 year in 96.7%. More than half of the participants (61%) were females with relatively young age (<30 years) this is most probably because most of the doctors in Sudan enter the exam of the first part of medicine during their internship or soon after. Unlike Oega  participants were male:female ratio was one to one. The current study shows that participants have good knowledge of the relationship between DR and others end organs affected by microvascular complications of DM. Hence, they are likely to refer all patients with renal disease or diabetic foot for eye examination because their presence could indicate the presence of DR and vice versa. Niyonsavye in Burundi's study  found almost similar results, where scored 92.6% of participants knew that DR and nephropathy respectively are microvascular complications in patients with DM. This results show that participants have poor knowledge on different parts of the eye that can be affected by DR and that could be examined for change due to DM except the retina which was largely mentioned. 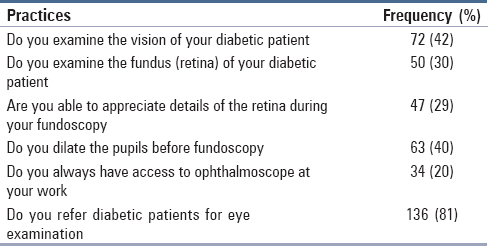 In addition, the participants do not know which changes are expected to be found on fundus examination. That means that participants are not able to assess a diabetic patient and hence contribute to screening for DR. These results are similar to other findings in other studies. Khandekar et al. reported 58% correctly gave the name of one eye part that is usually affected by diabetes. Only 43% of staff knew that the lens could be affected in diabetes. In the current study, only 180 (93.75%) responded to the distributed questionnaires out of the total of 225 who included in the study which was better than Al Rasheed and Al Adel who reported 51% of Saudi responders. Oega  and Niyonsavye quoted in a cross-reference of Mensah et al., who found that majority of respondents (94.5%) mentioned retina as part of the eye involved by microvascular complications of DM; but this does not show the knowledge because as the study is on DR, it is simple to mention the retina as part of the eye involved. This compares well to a study in Myanmar by Muecke et al. Only 46 (50.6%) and 23 (25.3%) participants knew that the lens and iris, respectively, could be involved. In the present study, Mensah's reported that the majority of participants mentioned retina; but this do not show the knowledge because as the study is on DR, it is simple to mention the retina as part of the eye involved. For changes that could be seen on the fundus, 63.7% of respondents mentioned CWS, 42.9% of participants mentioned dot-blot hemorrhages and 36.3% mentioned new vessels as well. Khandekar et al. found that the knowledge of the eye parts involved in diabetes and components that could be examined was limited. Only 58% correctly gave the name of one eye part that is usually affected by diabetes, and 43% of staff knew that the lens could be affected in diabetes. In the current study, about the factors which affected the presence or severity of DR, 118 (68%) of the respondents, mentioned poor glucose control as the factor that influences the presence or severity of DR which was almost in line with the North Region of Burundi's study by Niyonsavye who reported a positive respond of 69.1%. Both results were in contrary to Oega Kenyan's study  who reported a high score of 95.6%. The other factors which affected the presence or severity of DR were hypertension, duration of DM, and lipids profile, they were mentioned in the current study by 36 32.4%), 59 (34.0%) and 13 (7.5%) respondents, respectively [Table 3]. Oega in Kenya reported higher levels up to 46.2% for hypertension, and 28.6% for duration of diabetes. In another study, 93.1% and 68.97% were of the opinion that the duration of DM and pregnancy, respectively, can affect DR, 93.1% agreed that serum lipid profile is related to the severity of diabetic maculopathy. While in our study, participants did not know that pregnancy was risk factor that influences the presence or severity of DR. Women with preexisting diabetes who are planning a pregnancy should have a comprehensive eye examination and be counseled on the risk of development and or progression of DR. These women should be counseled by GPs because they are the one who is first in contact with them and then referred for an eye check-up by an eye worker. GPs need to be aware that pregnancy is also a risk factor for progression for DR. This could prompt practitioners to counsel diabetic women in childbearing years, especially those with preexisting DR, about the risk of progression of their disease while pregnant. In addition, GPs should refer diabetic women for eye check-up before and during pregnancy as well. Data showed most of the respondents, 161 (92.5%) and 155 (89.0%) mentioned eye and kidney, respectively, as the organs affected by microvascular complications in a person with DM. This was the much penalized knowledge that should be known by any medical graduate. Most of the respondents in the present study, 90.8% mentioned retina as the part of the eye that can be affected by DM. While 9.2% pointed out other parts of the eye; ranging from lens (26.7%), optic nerve (12.0%), cornea (11.5%), iris (5.7%), retinal blood vessels (5.2%), pupils (0.6%), and some said others (4.6%) [Table 2]. Which was incompatible with Khandekar et al. in Omani practioners' knowledge scores. Where 38% mentioned retina as the part of the eye that can be affected, lens (43%), optic nerve (23%), cornea (15%), and blood vessels (8%). 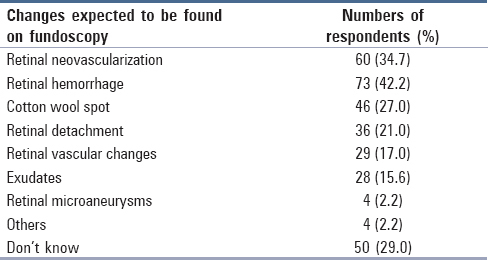 The response to the questions to evaluate the knowledge about fundus examination was 95.0% [Table 4] which it was excellent score as compared other studies, Khandekar et al. scored only 55%–30%. Although in the Omani participants, 35% were family physicians, 23% were physicians at hospitals, 2.5% was a dialectologist as compared to less qualified GPs and MRs in the current study participants. Participants in this study had poor knowledge in general compared to the study done by Mensah and fellows in Ghana in which the questionnaire was self-administered and made of open-ended question as well. In this study, however, the researcher was administrating the questionnaire and correcting them later after being filled. In our study, the questionnaire was administered section by section separately and was filled in the researcher presence. This may explain the different findings in these two studies. In addition, the wide difference between our study and the study done by Oega  in Kenya may be attributed to the fact that the questionnaire in our study was made of open-ended questions while that the other studies were given options to choose from. The current study showed that attitudes toward eye examinations were positive which was in alignment with Raman et al. who reported good knowledge and positive attitude in 55.6%–52.8% of GPs in South India. Seventy-five percent of participants in the present work showed disagreement with the statement that eye examination is only required in diabetic patients when vision is affected, and 51% of participants agreed that fundus examination done by a GP can help to detect early DR. Twenty-eight percent participants agreed that pregnant woman with DM require frequent eye check-ups than woman who is not pregnant with DM. Furthermore, 37% of participants felt that good lipid profile is essential for preventing vision loss in DR. These findings showed a good will among respondents but demonstrated a poor attitude toward screening for DR because they have poor knowledge of risks factors that influence the progression or worsening for DR. Thus, a need exists for training GPs and being involved in screening for DR. The study participants generally had a poor knowledge on DR although they had good knowledge about the relationship between DR and others end organs which can be affected by a microvascular complication of DM. They had good practice in the referral of diabetic patients 136 (81%). Unfortunately, the majority did not have any access to an ophthalmoscope at their workplace 146 (80%). Undergraduate ophthalmology training in medical school is not adequate according to 59% of the participants. Continuous medical education could be organized to refresh doctors' knowledge about DR and how to screen for it. Ophthalmoscopes and charts for testing vision should be available in the different hospitals mainly in departments of medicine where most of the diabetic patients come regularly. GPs should emphasize on the importance of eye check-up and refer all diabetic patients as soon as possible. This study was conducted in Khartoum State, so some GPs and MRs in the other states could not participate in the study, due to the lack of time. Cai X, McGinnis JF. Diabetic retinopathy: Animal models, therapies, and perspectives. J Diabetes Res 2016;2016:3789217. World Health Organization. A Framework and Indicators for Monitoring VISION 2020. The Right to Sight. Report of a WHO Working Group. WHO/PBL/03.92. Geneva: World Health Organization; 2002. WHO-IAPB. Global Initiative for the Elimination of Avoidable Blindness Action Plan 2006-2011; 2007. Verma R, Khanna P, Prinja S, Rajput M, Arora V. The national programme for control of blindness in India. Australas Med J 2011;4:1-3. World Health Organization. Blindness: Vision 2020 – The Global Initiative for the Elimination of Avoidable Blindness. ACTION PLAN 2006–2011: Printed in France: World Health Organization. World Health Organization. Our Cities, Our Health, Our Future Acting on Social Determinants for Health Equity in Urban Settings Report to the WHO Commission on Social Determinants of Health from the Knowledge Network on Urban Settings; 2008. World Health Organization. State of the World's Sight. Vision 2020 – The Right to Sight. Geneva: World Health Organization; 2005. Available from: http://www.vision2020.org. [Cited on 2011 Sep 30]. Raman R, Paul PG, Padmajakumari R, Sharma T. Knowledge and attitude of general practitioners towards diabetic retinopathy practice in South India. Community Eye Health 2006;19:13-4. Schumacker RE, Lomax RG. A Beginner's Guide to Structural Equation Modeling: Third Edition. New York, London: Routledge Taylor and Francis Group, ©2010 by Taylor and Francis Group; 2010. Fatema K, Hossain S, Natasha K, Chowdhury HA, Akter J, Khan T, et al. Knowledge attitude and practice regarding diabetes mellitus among nondiabetic and diabetic study participants in Bangladesh. BMC Public Health 2017;17:364. Oega RB. Diabetic Retinopathy: Knowledge, Attitude and Practice among General Practitioners in Provincial Hospitals in Kenya. Mmed Dissertion; 2012. Niyonsavye L. Knowledge, Attitudes and Practices on Diabetic Retinopathy among General Practitioners in District and Regional Hospitals in the North Region of Burundi M. Sc Thesis in Ophthalmology to University of Nairobi; 2015. Khandekar R, Shah S, Al Lawatti J. Retinal examination of diabetic patients: Knowledge, attitudes and practices of physicians in Oman. East Mediterr Health J 2008;14:850-7. Al Rasheed R, Al Adel F. Diabetic retinopathy: Knowledge, awareness and practices of physicians in primary-care centers in Riyadh, Saudi Arabia. Saudi J Ophthalmol 2017;31:2-6. Mensah V, et al. Knowledge, Attitude and Practices of Diabetic Retinopathy among Officers in the Regional Hospitals of Ghana. MDed Dissertation; 2013. Muecke JS, Newland HS, Ryan P, Ramsay E, Aung M, Myint S, et al. Awareness of diabetic eye disease among general practitioners and diabetic patients in Yangon, Myanmar. Clin Exp Ophthalmol 2008;36:265-73.